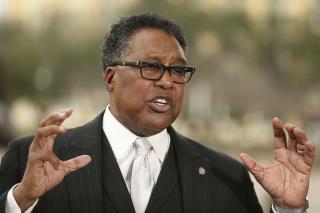 (Newser) – Dallas Mayor Pro Tem Dwaine Caraway accepted more than $450,000 in kickbacks and bribes, in part through a phony consulting agreement, gambling money, and trips to Las Vegas and elsewhere, federal prosecutors said Thursday. Caraway, the second highest-ranking elected official in Dallas, pleaded guilty to two federal charges in the public corruption case and has resigned from the Dallas City Council, per the AP. Federal court records show he received kickback funds from Robert Leonard, president and owner of Force Multiplier Solutions, and Leonard's business associate. US Attorney Erin Nealy Cox announced Thursday that a judge accepted the guilty pleas from Caraway and Leonard. Cox says that Leonard, aided by his associate, paid a combined total of more than $3.5 million to Caraway and Rick Sorrells, former superintendent for Dallas County Schools, in return for favorable action related to Force Multiplier Solutions, a technology company that puts cameras on school buses. The effort, she says, helped the company and Leonard secure more than $70 million in contracts and agreements with Dallas County Schools, the troubled agency which residents last year voted to dissolve. The organization had provided transportation for thousands of students. "An entire public entity relied upon by parents and school children alike was destroyed in the wake of this scandal," Cox said Thursday. Click for the full story. SO all you SJW's out; how are you feeling now with all these Hood Rat politicians being being put in office due to their race as an attempt to pacify demands by a small minority are found just or more corrupt than the other POS politicians? Basically what I have been saying that explains the circumstances of the Trump situation. Everyone inside the Beltway is guilty of something, sometimes, many things. Influence peddling; extortion; stock price manipulation; embezzlement; money laundering; mail fraud; assigning fat government contracts to cronies, paying huge prices for shoddy workmanship and substandard material; perjury. And, if there are any who haven't committed any of those crimes, they certainly know what the others have done and, if they haven't reported it, they are complicit. And they all rely on each other to carry out the crimes and to keep quiet. Sometimes just mentioning someone's name could open up a can of worms. They have to be cagey in answering questions. They have to close ranks. Among other things, they might gloss over others' involvement just to keep their name out of something, for example, or not mentioning where corners might be cut out of consideration for someone who does the government some benefit using methods that technically might be called unethical, but don't really work against anyone who doesn't have enough money to buy their way out of problems. A number of the “little white lies” Hope Hicks mentioned. In the end, there is no reason not to assume necessarily everyone among every politician's friends is engaged in criminal behavior. That includes Trump's. But, in trump's case, they are not guilty of what the Democratic racketeers are trying to say they're guilty of. But the Democratic Racketeers don't care. They know there isn't a conspiracy with Russia to throw the election and annihilate the United States. They just want to brutalize the Trump White House. So they took advantage of the fact that every Republican politician has ugliness in their past. They cobbled together a fraudulent claim, they demanded a “special investigator” to “protect the United States”, then they proceeded with an “investigation” that was really nothing but a fishing expedition, certain there was more than enough there to come up with and pretend is “part of the conspiracy with Russia”. Trump's people responded as people with ugly backgrounds do, hiding complicity, misrepresenting situations, trying to mislead investigators and the Democratic Racketeers tried to depict that as all tied only to complicity with Russia to destroy the U.S.